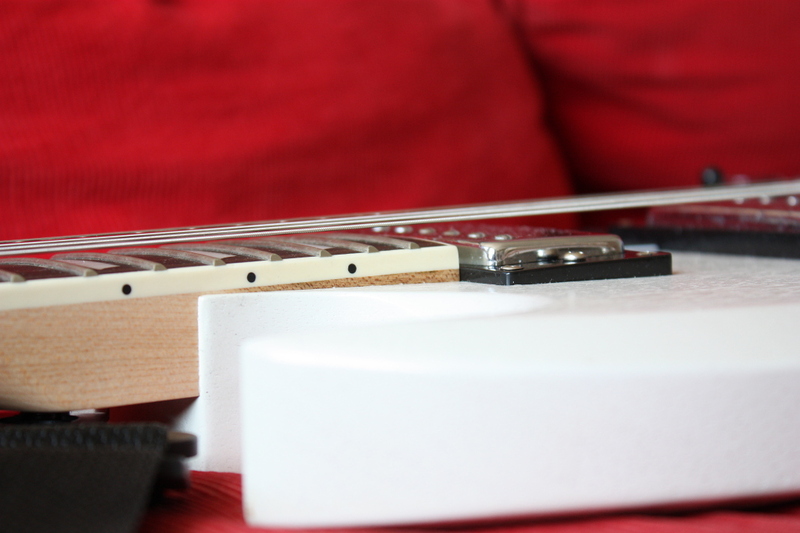 On to the third part of how I built an electric guitar. Now that the assembly is done, the stringing is next to make a playable instrument. Stringing itself is nothing special so far for someone already playing guitars regularly. Nevertheless, with the strings that came with the kit I made a really ambarassing mistake: By setting my tuning device in a wrong pitch somehow, I tried to tune the lower strings that high, that the d-string broke and the e- and a-strings were under pretty high tension. In the end: Happy with the string height and overall playability. Teased in the first part of this report, here is the final outcome of the art design. I pre-sketched the robot with a pencil and then finished it cautiously with a black permanent marker. Welcome to the progress report of my current project: build a guitar from a kit. The kit in this case is a SG style one from German store Thomann. 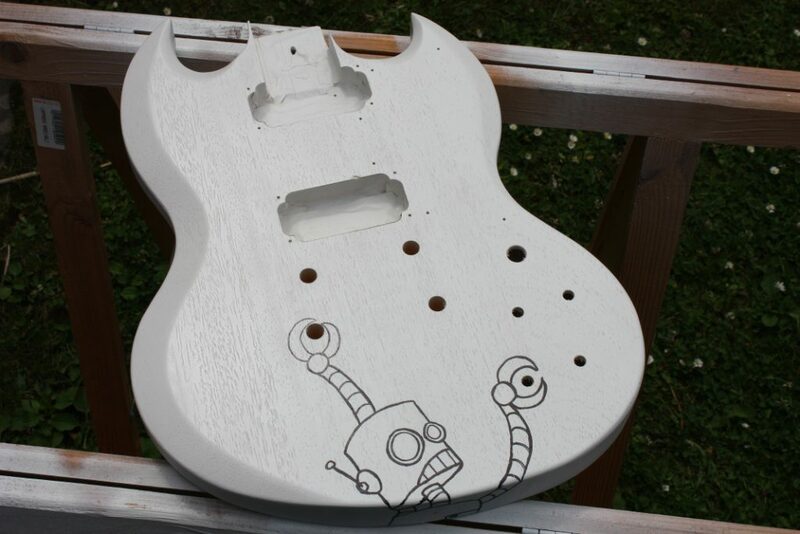 The kit comes with a wooden guitar body already prepared for painting. So my first task is to get some basic colour on it. Here I have chosen a plain white as the basic colour with the idea to further add some handmade drawings. 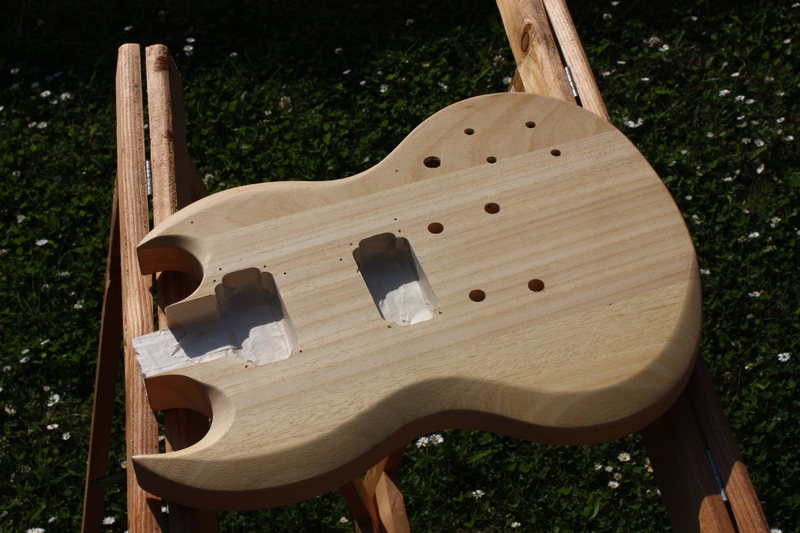 The raw body with the pickup holes masked. Wood is probably Poplar or Limewood, but no info given by the manufacturer.